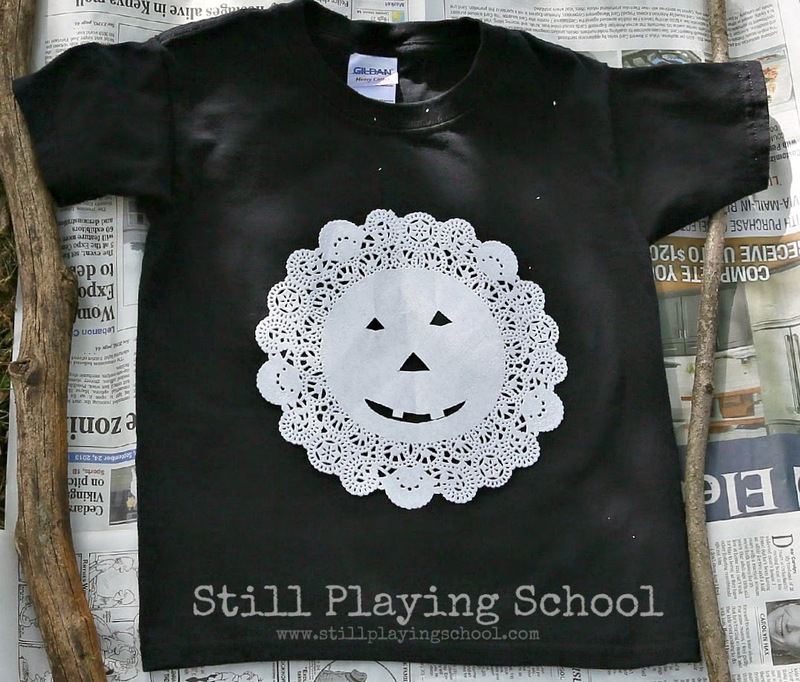 Our DIY Pumpkin Doily Shirt is a fun and festive wearable craft for kids for the Fall! These shirts turned out super cute and they also have a story to go along with them that pretty much sums up our life. 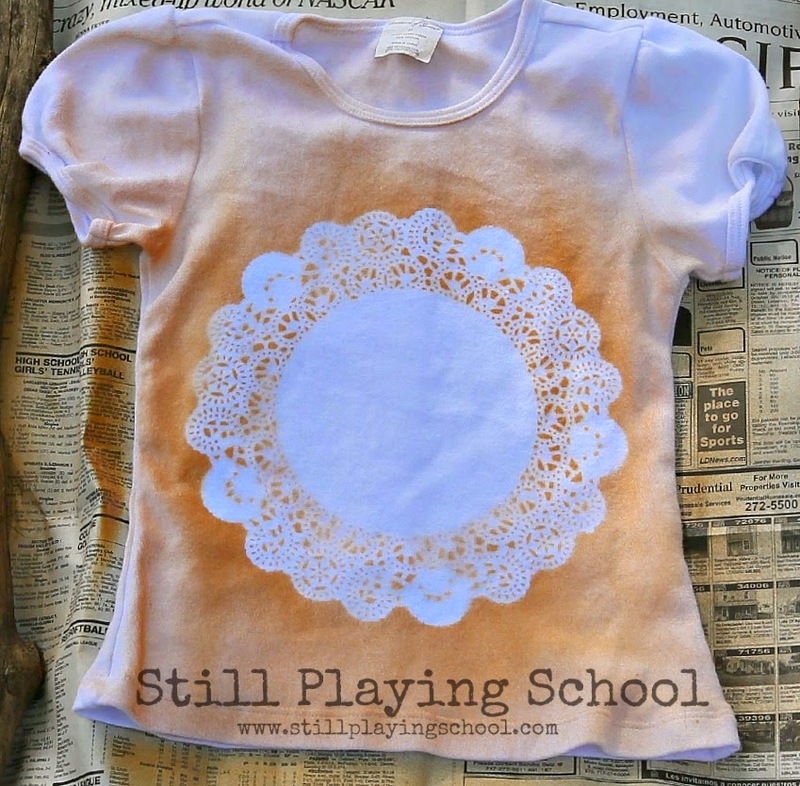 Inspired by artchoo's tutorial for spray painted doily shirts. You'll definitely want to see how they created a multicolored look! I wanted to try to make pumpkin ones for Fall. This was a mommas only craft while the kids played, occasionally checking on our progress with interest but otherwise safely away in fresh air. I enlisted the help of my BFF neighbor so we could take pictures of our process, too. The directions couldn't be simpler or more straightforward! Place a doily on a pre-washed white t-shirt. We made a onesie for D, too. Lightly spray paint over the doily then remove. 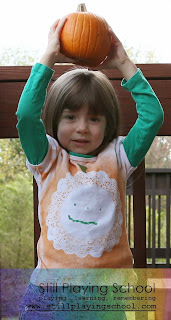 Once dry, I brought the shirts in to add a stem with a green fabric marker. I left the marker near the shirts. Can you see where this is going? 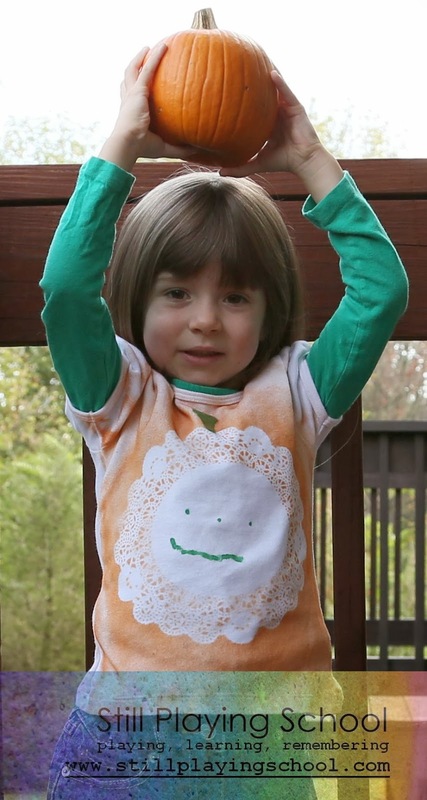 I had fully intended for these shirts to have faceless pumpkins that could then be worn until Thanksgiving but E had other plans. She took it upon herself to draw a face on her shirt and D's! They are so adorable that I could only love her added details and the sweetness they added to the whole project. My neighbor BFF also tried to cut out her own jack-o-lantern face on the doily but the orange paint didn't show up well on the black shirt she used. If you try this and it works, we'd love to see your version! 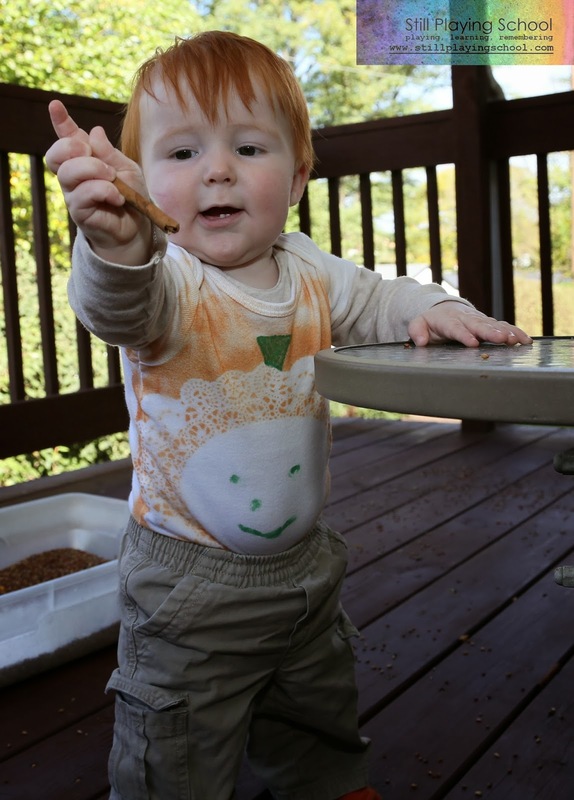 - Place the pumpkin part of the belly of a maternity shirt! 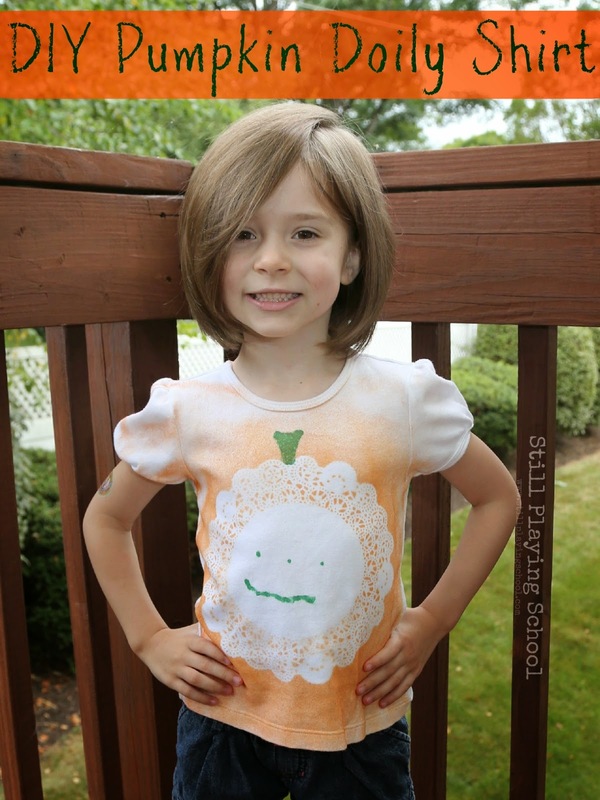 - Create a whole classroom of matching shirts for a fall festival celebration. Allow the students to cut the doilies or draw the jack-o-lantern faces on when dry. 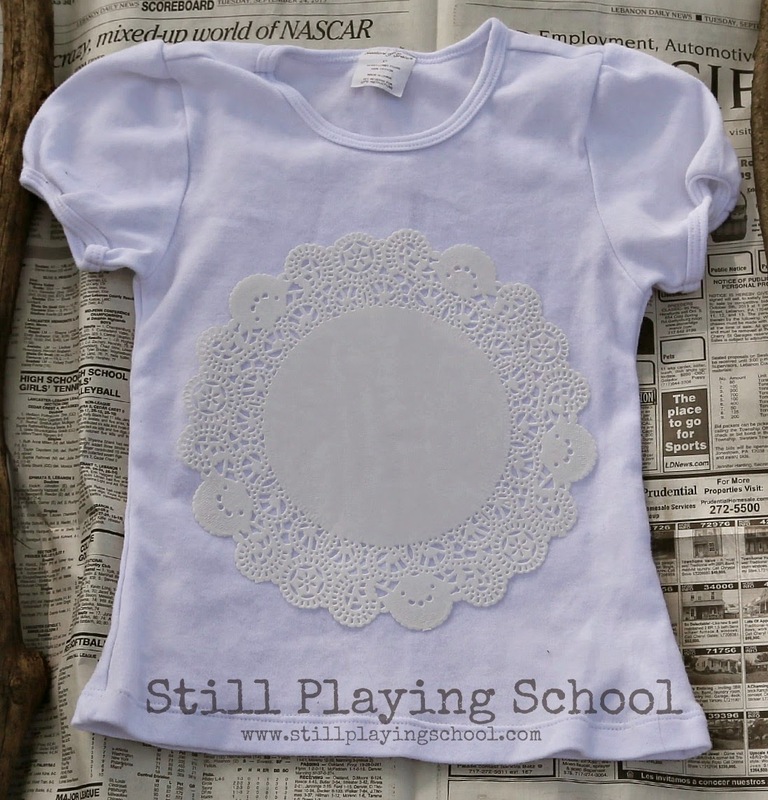 - Try stamping over the doily with fabric paint and a sponge instead of using spray paint. We'll stick with our sneaky little artist's green jack-o-lantern faces! Edited to add: This post (and the shirts) are now a year old. 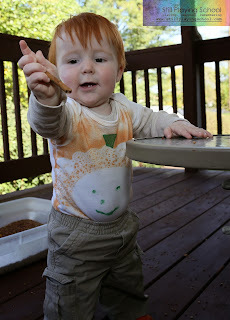 I have updated the first image to be a photo of E wearing her shirt again this year so as you can see it has washed and held up well! Oh goodness these are cute! Love that Artchoo! She is always inspiring good stuff at our house too!